As part of our recent family gathering to celebrate a special birthday for Susan, some of us were able to go to brunch together. Sarah and Evan were busy getting ready for service at their new restaurant, so they were not able to attend. Kevin was at the library. Everyone else gathered on the back patio of The Tipsy Pig not far from the San Francisco Marina. The weather was beautiful, and the restaurant was friendly with excellent service. There were lots of interesting drink choices. 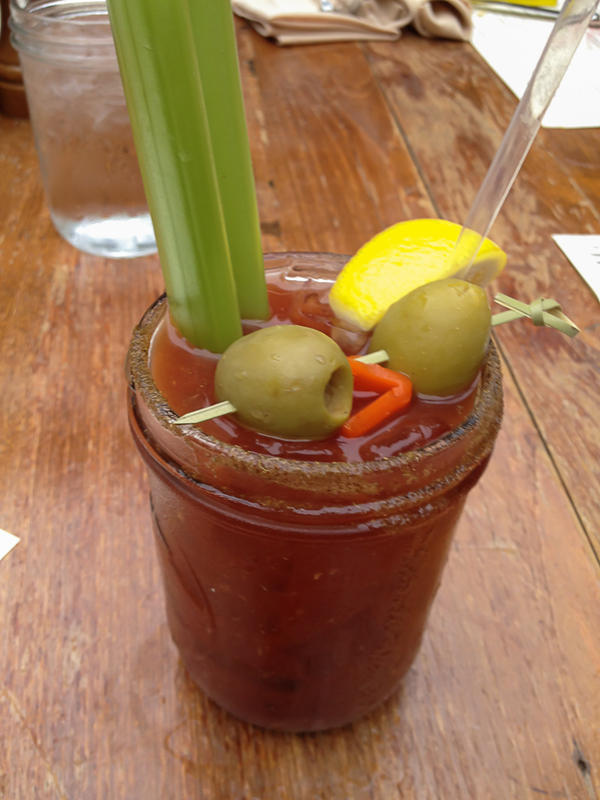 I picked the Mary Pig, a classic bloody mary. It was extremely well made and decorated with olives and a stalk of celery. Food choices were even better. 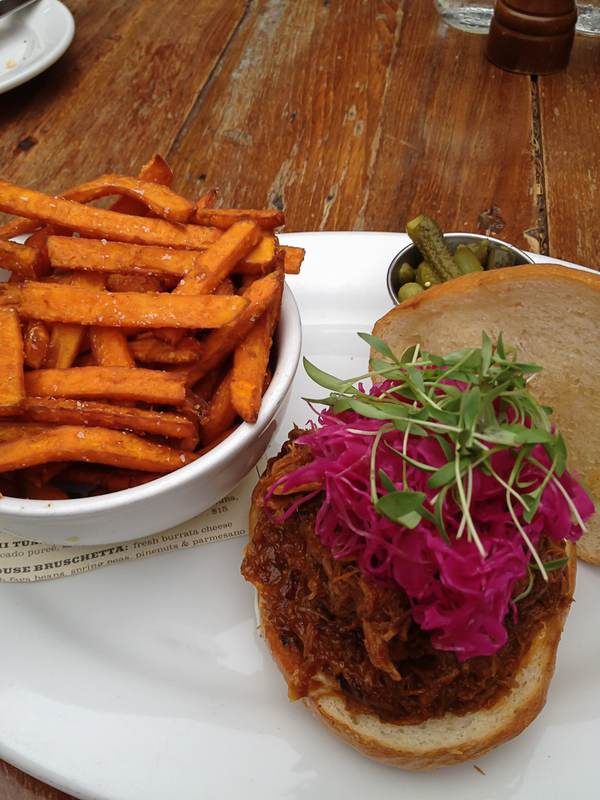 The Chimay braised pulled pork sandwich was with served aioli, and red cabbage slaw came with sweet potato fries. It was beautifully presented and very tasty. 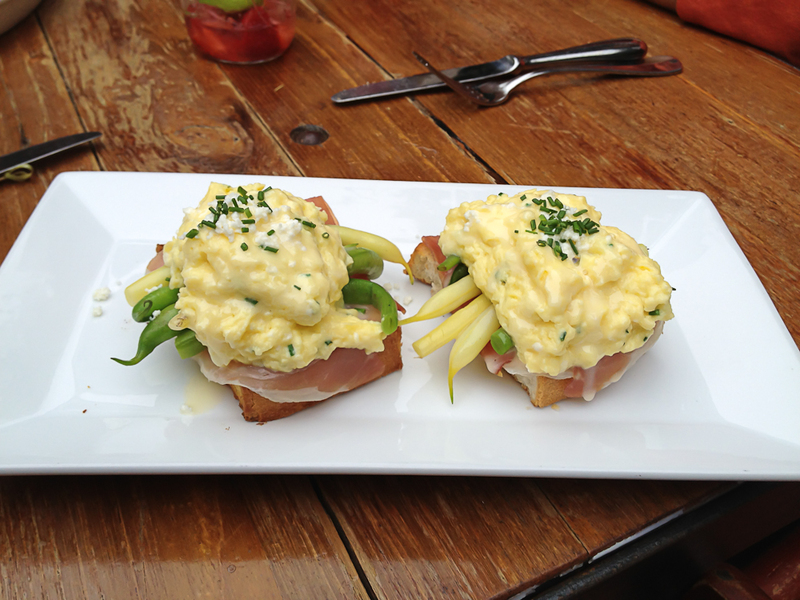 The chive-goat cheese scramble was beautiful: two squares of golden eggs scrambled with goat cheese, served on squares of thick toast and prosciutto, topped with Meyer lemon beurre blanc and a side of wax beans. 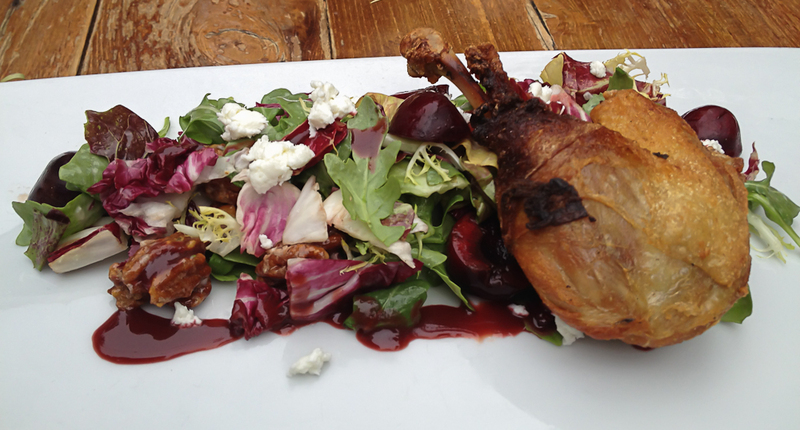 The crispy duck confit came as a generous-sized duck leg finished with radicchio, spiced pecans, goat cheese, and bing cherries with champagne-tarragon vinaigrette. 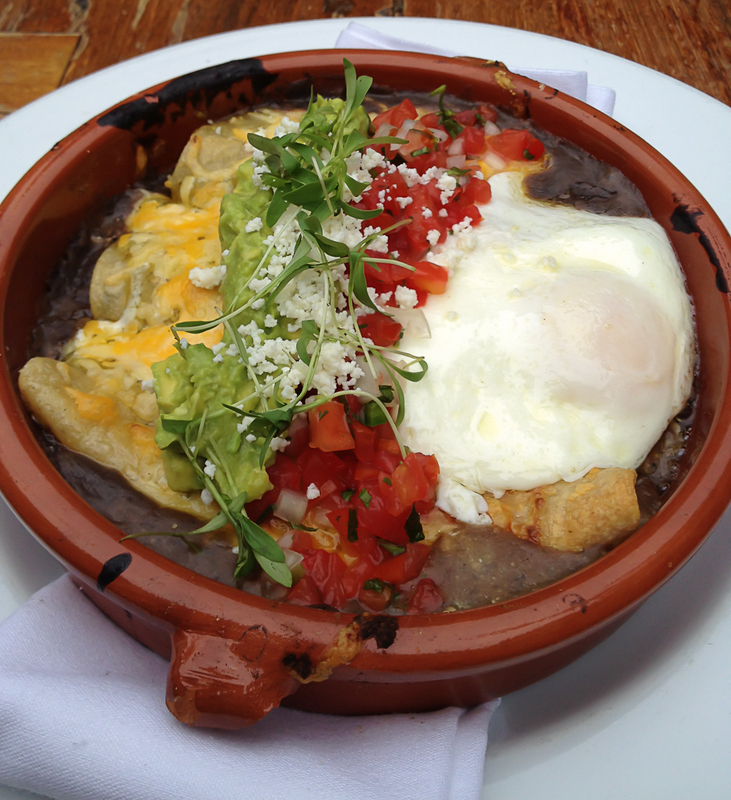 I chose huevos rancheros. This is one of my favorite dishes, but this version was unlike any I have ever seen. It was beautiful, not to mention tasty. A perfectly cooked egg was served on rolled tortillas and a bed of black beans, sauced with salsa verde, and dressed with pico de gallo and avocado. Crumbled asadero cheese garnished the top. It was a wonderful choice. 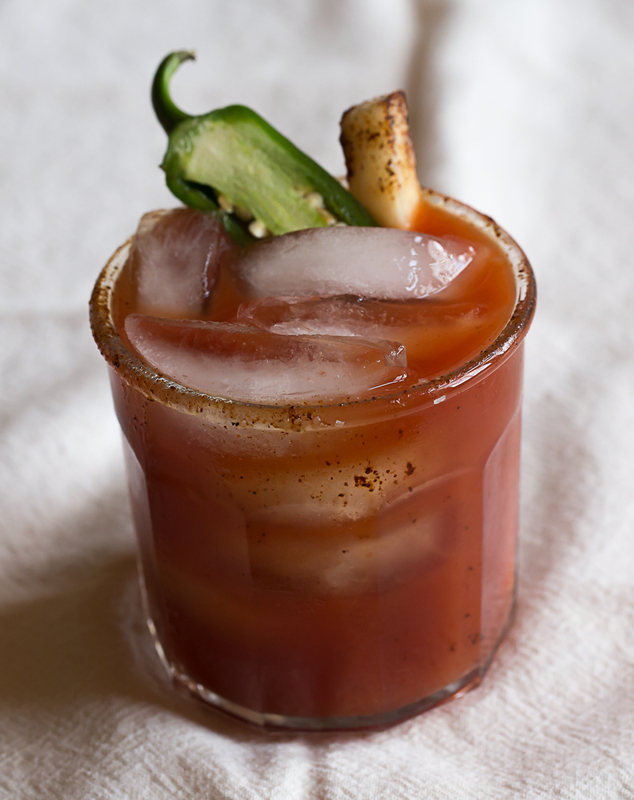 One of these days I plan to share my recipe for huevos rancheros, but today I would like to give you the recipe for my version of a bloody maría – a tequila-based bloody mary. Combine tequila, lime juice, vegetable juice, Worcestershire sauce and Chalula hot sauce in a cocktail shaker with a cube of ice and shake well. 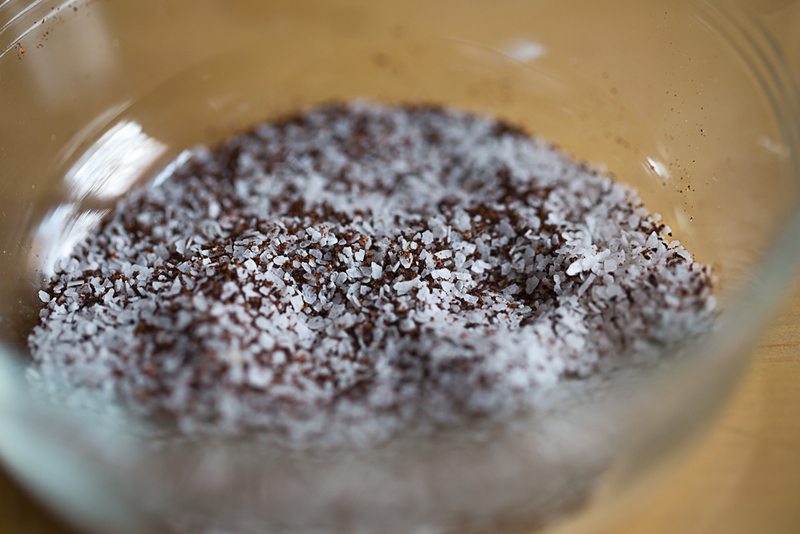 Strain into the serving glass.